​It Happened in an Instant in Chicken Soup for the Soul: Power Moms (Simon and Schuster, 2011). ​after I return home and the power of being a "super" mom. Real Moms Love to Eat (Penguin Books/NAL, 2012) Take a look at your relationship with what you eat and find a way to fall in love again with flavors, food memories, and how eating makes you feel. A 21-day healthy eating plan and loads of lip-smacking recipes will have you back in those skinny jeans before you know it, without sacrificing your old favorites. Real Moms Love to Eat: Start with healthy food--add pleasure, and real life. Now you have the recipe for creating a food legacy that not only nourishes you and your family, but also uplifts the entire planet. This book gives you the blueprint for eating healthfully, and practically--while also feeding your family everyday. What's not to love? Real Moms Love to Eat: A very good primer to help you begin to make your diet an ally, not an enemy, in today's time-compressed world. Gripping and emotional debut suspense thriller, Pink Slips, tells a spine-tingling and harrowing story of survival, friendship, doggedness, and love. The intimate power of the relationship between Betsy Ryan and her beloved dog, Barney gives this suspense thriller soft spots to counter the uncertainty and intense action. ​This compelling and gripping debut suspense thriller, PINK SLIPS, is filled with unexpected twists that will keep you page-turning and rooting for Betsy Ryan until the early hours. Pregnant Betsy Ryan is confronted with threatening pink notes from an anonymous person, forcing her to face fears from another attack that happened ten years ago. Together with her extraordinary dog, Barney, parents, and good friend, Misty, she will unearth clues and dig deep to fight for her unborn child and her life. A story about love, friendship, family, and perseverance. A taut yet expansive mystery thriller, Pink Slips introduces a powerful new literary voice to a genre steeped in mediocrity. It’s a genre which continues to evolve and there is a definite feeling of reinvention which Aldrich has certainly leveraged to deliver a top-notch narrative. Suspenseful with the kind of razor edge prose which should be mandatory for a mystery thriller it’s a novel that’s dependent upon the reversal of expectations with Aldrich introducing sublime twists that are sure to keep her readers on tenterhooks throughout. Yes, much-favored tropes are evident but she never relies on them whilst a cleverly constructed plot comfortably manages to stay ahead of her readers at all times. Describing it in detail would ruin a cracking denouement that packs a powerful punch, but suffice to say there is more than enough here to keep the most demanding of genre fans turning its pages. It would, however, be disingenuous not to explore character development which is something Aldrich naturally excels at. Grounded with real world personas they are not only vividly rendered but provide genuine insight into Betsy Ryan’s life and intensely articulate the chilling sense of vulnerability that envelopes her as events unfold. 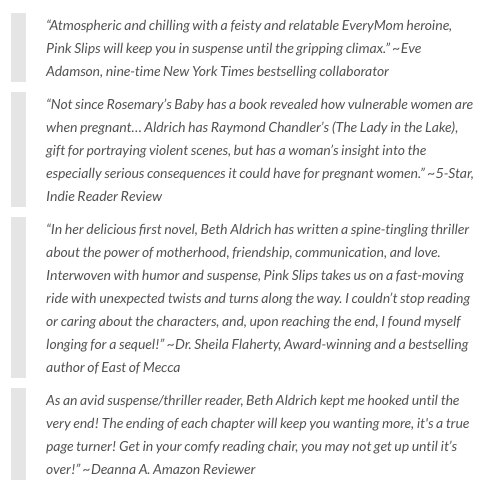 *Top notch storytelling and an exceptional fiction debut, Pink Slips proves a must read and one that raises high expectation for future releases from Aldrich. It is recommended without reservation.